Citizens vote in Alhambra, California on November 6, 2012. Thank you for asking, Rasmussen Reports. Just 17% of Likely U.S. 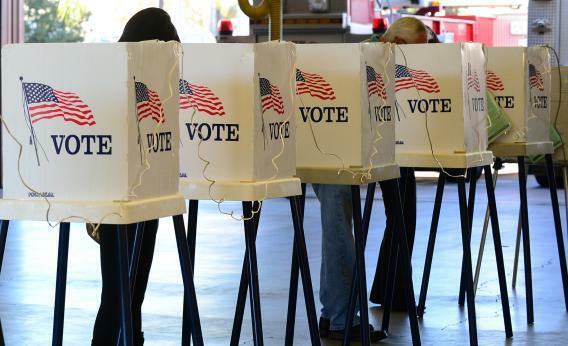 Voters believe it is now too hard to vote in the United States. Twenty-seven percent (27%) think it’s too easy to vote in America today, while 50% feel the level of difficulty is about right. Without seeing the partisan breakdown, we can safely assume that these numbers skew toward partisan sympathies. The president, in his inaugural address and in the State of the Union, has called to make voting easier. Partisans tend to gravitate toward the opinion shared by fellow partisans and condemned by the adversary. It’s just surprising in this case because voter ID advocates like John Fund are typically also in favor of making voting easier.